George Osborne is in a curious position. The UK chancellor has spent the last six years sternly warning against easing up on his Conservative government’s efforts to reduce public debt and deficits as a percentage of GDP. Post-Brexit, he may have to resort to fiscal stimulus that sends them back up. Even if both main political parties weren’t in disarray following the June 23 vote, the UK economy is entering a difficult phase. Lead indicators are already consistent with a recession, Credit Suisse has said. Britain’s finances were hardly perfect beforehand. It was hard to cut public services and raise taxes during the 2010-2015 coalition government. As a result, public sector net debt for the 2016/17 tax year is expected to be 82.6 percent of GDP, while the budget deficit is forecast at 2.9 percent, according to the Office for Budget Responsibility. The critical question is whether the economy slows down sharply enough to warrant fiscal stimulus on a par with the 20 billion pound package of spending rises and tax cuts put together in 2008 by the UK government to deal with the global financial crisis. Osborne gave few pointers in a briefing on June 27. Instead he just said nothing would happen until a replacement for Prime Minister David Cameron materialised. The good news is there is some breathing room. Back in March, when the economy was still growing at a healthy clip, the Institute for Fiscal Studies said the UK could borrow 1.5 percent of GDP and still see debt fall to 65 percent of national income by 2050 as long as the economy grew by 1.5 percent annually. Admittedly, such growth rates look out of reach after the UK vote, but 10-year gilt yields have fallen to 1 percent. As long as investors don’t take fright, the government should have scope for borrowing to invest in job-creating infrastructure. Moreover, there is no need to stick to Osborne’s prior goal of achieving an overall budget surplus by 2020 or to hang on to the man himself. The chancellor infamously said before the referendum that he would be forced to deliver not a stimulus but further austerity – via spending cuts and tax rises – following a leave vote. 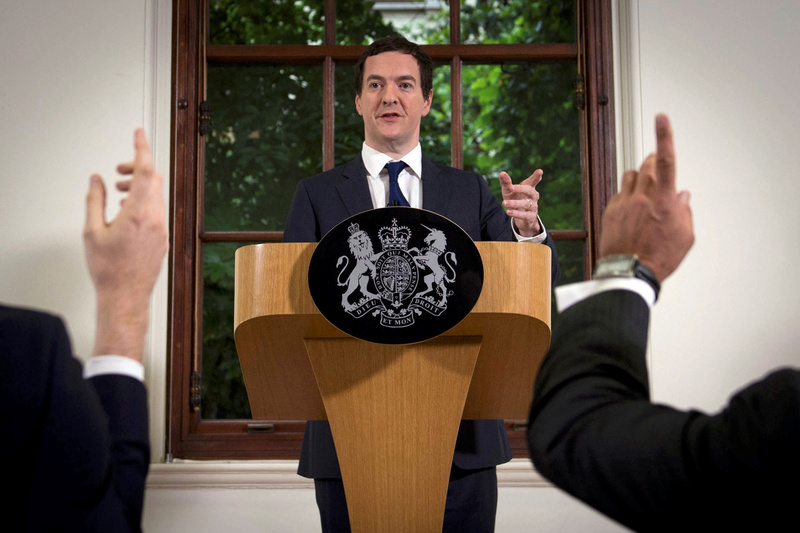 Such instincts make him a less-than-ideal person to steer Britain’s economy at this juncture. UK chancellor George Osborne said on June 27 that the UK economy was about as “strong as it could be” to deal with financial and economic turmoil. Osborne said the government should wait until a successor to Prime Minister David Cameron was in place before deciding how to change its fiscal plans in response to an expected economic slowdown. During the campaign he had said he would have to raise taxes and cut spending were Britain to quit the European Union. Writing in The Telegraph newspaper, prominent Leave supporter Boris Johnson said Britain would be able to retain access to the single market, while taking back democratic control of its immigration policy and spending a “substantial sum of money” no longer sent to Brussels on other priorities. As of 0945 BST, the FTSE 100 was down 1.3 percent, the FTSE 350 was down 3.6 percent and sterling had fallen 2.4 percent against the U.S. dollar.